Beginning last week, in anticipation of Father’s Day, we’ve run new and old stories about men and abortion or, conversely, the beauty of being a dad. The following read several years back—it is a Dove commercial celebrating fathers. It’s here and lasts only one minute, one second. About half-way through, “For the times they answered our call” flashes on the screen. The snippets of rock-solid fathers enjoying the chance to be there for their kids represents the very antithesis of the times men fail to answer the call of a spouse or girlfriend who is facing an unplanned pregnancy and feeling utterly alone and fearing abandonment. Everyone who’s been or is a dad remembers catching our son or daughter as they jumped into the pool, or soothing a crying baby, or helping (usually an impatient son) get his shirt over his head, or answering the muffled “daddy?” from our daughter who has awakened because of a bad dream. Then the commercial seamlessly moves–as we move–to the coming of age stage where we kiss our adolescent son on the head (probably the last time he will allow us to do so), or drive out on a rainy night to answer a call from a adolescent whose car won’t start, or consol a daughter whose heart has been broken. Before you know it you are dancing with your daughter at her wedding and watching an ultrasound of your daughter’s or daughter-in-law’s baby. And, truth be told, it does seem as if 20 or 25 years of fatherhood has flown by in one minute and one second. The Dove commercial is all the more powerful because there is absolutely nothing dramatic or out of the ordinary in the examples of “answered” calls. One happened at 4 this morning to me, in my duel role as dad and granddad. A big deal? Of course not. It was my privilege to be able to help. The Dove commercial ends, “Isn’t it time we celebrate dads?” Well, I suppose that’s true, although I believe that misses the larger and more significant point. 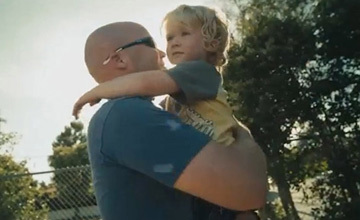 As a dad/granddad, the ad beautifully celebrates the privilege of faithfulness—of doing the little things (which is after all what makes up most of life) as well as being there for the high-highs and the low-lows. Everyone likes to be flattered, but dads don’t need to be celebrated for doing what we ought to doing in the first place. Rather we should give thanks that God has placed these children in our lives. We should be grateful beyond words to be able to add to the typically far more important contribution of their mother in raising our kids to be good men and good women.